SKU: Q8-END. Category: End Cut Solutions. Using Oxine Copper (copper-8-quinolinolate), Q8 Log Oil® End Cut Solution is specifically for augmenting the factory treatment of pressure treated wood to maintain the warranty offered by the wood treater. If you are using Q8 Log Oil for logs, decks, railings, etc, please refer to product information and instructions for Outlast­­®­ Q8 Log Oil®. Apply Outlast® Q8 Log Oil® End Cut Solution to end cuts of pressure-treated lumber to help prevent deterioration caused by termites, mold, mildew, and decay causing organisms. Pressure treated wood is augmented with decay control chemicals to enhance longevity. These chemicals penetrate all surfaces to a significant level, but do not reach the very center of the board. When 5/4 decking or structural supporting members of a deck is cut or drilled for fasteners during construction, the center, untreated portion is exposed. This end cut needs a boost of extra protection from a wood preservative to augment the factory treatment and maintain the warranty offered by the wood treater. 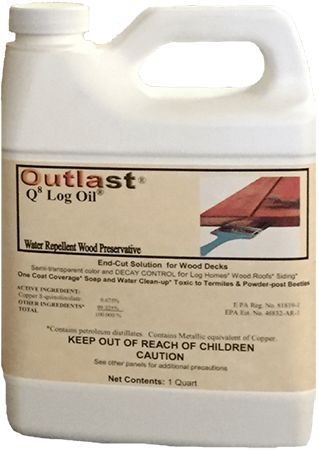 Outlast® Q8 Log Oil® End Cut Solution is an EPA registered wood preservative and exterior finish in one. The formulation is AWPA (American Wood Protection Association) vetted and specified to protect end cuts of pressure treated lumber from decay causing organisms (rot, mold, termites, powder post beetles, etc). For best results, hand brush or dip the cut portion of the wood until saturated with Clear (00) Outlast® Q8 Log Oil®. The solution “wicks up” the cut end grain to “heal” the cut end. For pressure treated end cuts, fastener punctures, cross arm maintenance, utility poles, piling contractors and railroad ties we recommend Outlast­­® Q8 Log Oil­­® in Clear. A backpack sprayer is a handy way to easily deliver the required amount of remedial wood preservative to exposed cut areas. Thoroughly shake or stir the container to disperse the pigments evenly if using Natural (02) End Cut Solution. Apply to the surface area by either dipping, brushing, or spraying with a pump up sprayer. Outlast® Q8 Log Oil® is “self-leveling” and easy to work with. If any liquid remains unabsorbed after about 20 minutes, simply mop it up and smooth it out. Initial curing time is normally within a day or so, but the surface can be gently walked on when no liquid or puddles are visible. Expect the appearance to be somewhat darker during application because it lightens significantly during the approximate 2 week total curing period. Reapply annually for the first 2 years, and as desired thereafter. After construction, apply more of the same or select one of our 6 pre-tinted Outlast® Q8 Log Oil® colors to the entire project – decks, steps, spindles and railings – for a beautiful translucent stain. (Other commercially available oil or water based deck stains may be applied according to the manufacturer’s recommendation). Be aware that most commercial deck stains mandate a drying period after construction and prior to staining to allow the wood to dry. This is because newly purchased treated lumber is usually very wet, from the pressure treating process. Be the first to review “Outlast Q8 Log Oil End Cut Solution” Click here to cancel reply.